But this sleep stuff, it got me thinking about planning for success. Sometimes the things we really want require extra planning. Like eating well, for example. I hate meal planning. I mean, I really really really don’t like it. Yes, there are more eloquent ways to put that, but the childish way in which I dislike the process is best described in simple language. No fluff. I don’t like it. At least I didn’t. First, we were on the road again this summer for about a week and didn’t have access to a kitchen. This meant eating out or grabbing food from the market to be eaten right away without much prep. And it didn’t feel great. Eating out for several days left me feeling bloated, heavy, and tired (even more tired than the simple result of having an infant who didn’t like to sleep at night). So when we got home, we started on a specific meal plan to clean up our guts, ditch the sugar and additives, and get back to home-cooked whole foods for the week. We made a simple and all-inclusive meal plan (breakfast, lunch, dinner, and snacks!) based on the seasonal detox I was building for clients. And boy oh boy did I feel better. Lesson #1: Meal planning helped me eat better to feel better in my body. Second, I realized that I’m happy to make meal plans for other people. It makes me happy to help other people create this wonderful tool to make their lives easier and healthier. But as a stubborn and independent person, I don’t like committing days in advance to eating a certain meal. Because what if I don’t FEEL like it on Thursday? This is the argument in the back of my head every time I sit down to write a meal plan for our family. But if I’m happy to do it for others because I believe it has value, and I know that meal plans help me feel better, spend less time trying to decide what to make, alleviate the stress of wondering if I have all the ingredients for dinner, and they can ensure that we are eating good foods that truly nourish us… why would I want to hold onto the story that planning takes away my freedom? Because that’s what it really boiled down to. If I wrote down all the meals for the week, I was trapped and didn’t have a choice. See how silly that sounds in retrospect? It’s not even that I want something else right now. It is that I might want something else. Maybe. Don’t fence me in. Because I am a whole person encompassing all of these conflicting feelings and thoughts, I get to choose which path to take. I get to decide if I want to be the big-picture-perspective adult or the live-in-the-moment child rebel. The thing the child rebel sometimes forgets is that I really am a grown up now that has the capacity to shift, change, grow, and even alter course. I am making choices. All the time. Making a decision now does not mean I am not allowed to change my mind, to make a different decision later. But having a plan, well, that’s the best start to get me where I want to go, you know. 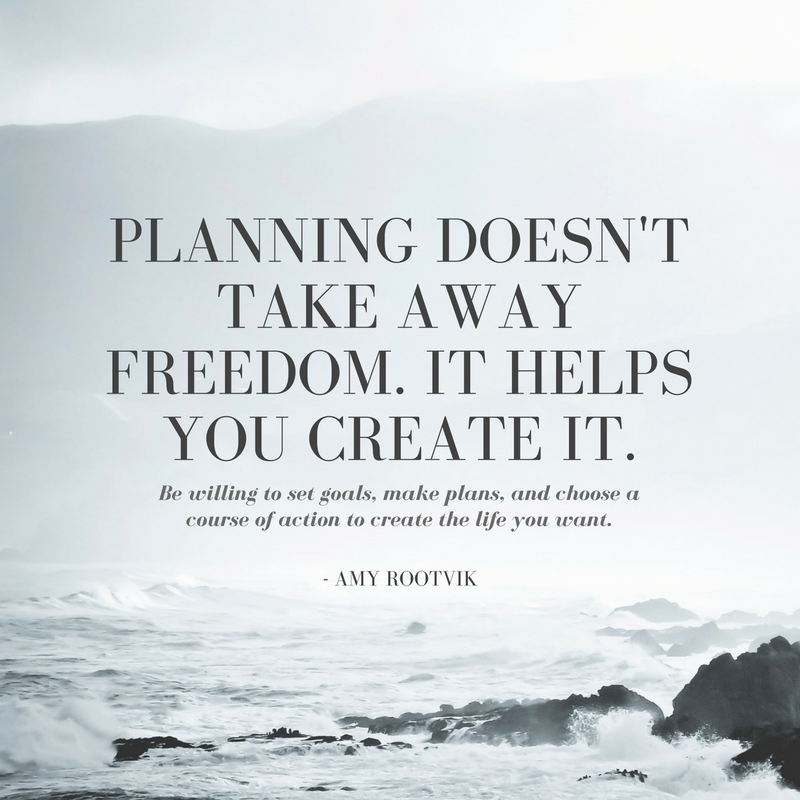 Lesson #2: Planning doesn’t take away my freedom. Every moment of every day. We can choose how to nourish ourselves, how to treat our bodies, how to talk to ourselves and others. We choose our thoughts. We choose our actions. And we can choose to meal plan or not to meal plan. Honestly, I don’t want to go back to living without a plan. Having a meal plan makes my life so much easier. Grocery shopping is faster and easier. Meal prep is a breeze. And I like seeing what my creative options are within a defined structure. It pushes me to be a better cook. It reminds me of poetry classes in college and graduate school where having to stick to a strict form challenged me to up my writing game, to get creative inside the box. And seriously, meal planning helps with blood-sugar regulation. We have meals ready to go (like lunch), and then we avoid the dreaded hangry phase. (Dear lord, please may you never have to see me hangry.) So meal planning gets mad props for that alone, even if there are no further benefits! But, of course, there are. So I will do meal plans every week. Because I can. Because they help channel and calm the chaos. Because they make my life better, easier, and happier. And that’s a kind of freedom I’m willing to work for. As we look toward the next season, another time of transition, what are you planning? What steps are you taking to reach your goals? Or perhaps let’s just look at today. What are you planning for today? My clients often come to me knowing that they want things to be different. They want more energy, less fat, less stress, and better fitness. But they usually don’t have a plan. Goal setting and planning go hand in hand. Once you identify the goal, the planning is an engaging mapping process. The execution is the most exciting part, letting all that desire fuel you past the fear of change into a new way of doing things, a new way of living, moving you toward what you truly want. I know you would like to feel energized and vibrant. I know you’d like to know where you’re going and how to create the life you’ve always wanted. I’m excited to tell you that I have two spots opening up in my coaching schedule in mid-September. If you’d like to be considered for one of these spots, contact me here.